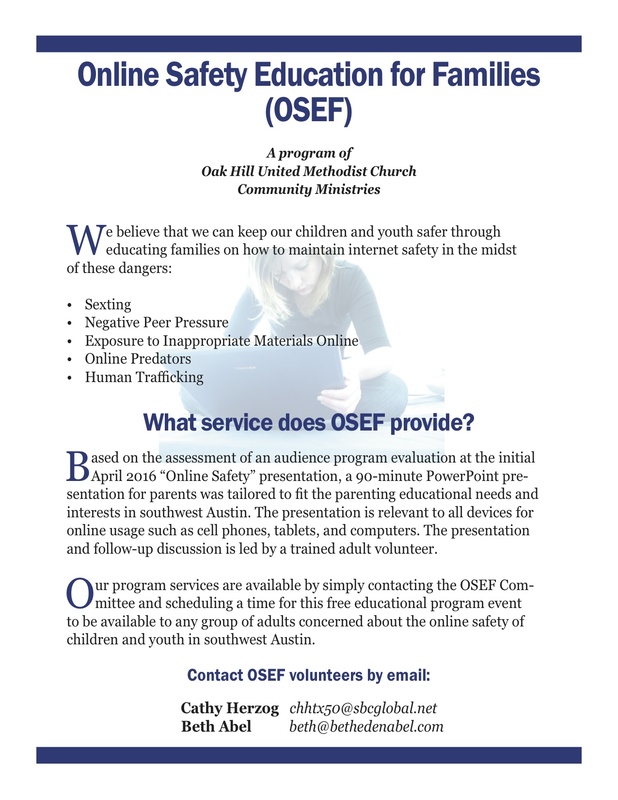 The Online Safety Education for Families (OSEF) program is a program of Oak Hill United Methodist Church Community Ministries. The following presentation has been developed by the OHUMC Human Trafficking Committee. As a Community Ministry of Oak Hill UMC Human Trafficking Committee, we would be happy to bring this presentation to you at your location. This presentation is a gift, there is no charge. The presenters have professional backgrounds in communications, homeland security and mediation, school nursing and counseling. – How do you talk to your child about the internet? – What does your child know about the internet that you don’t know? – What sites should you be aware of today? – What can you do to keep your child internet savvy and safe?